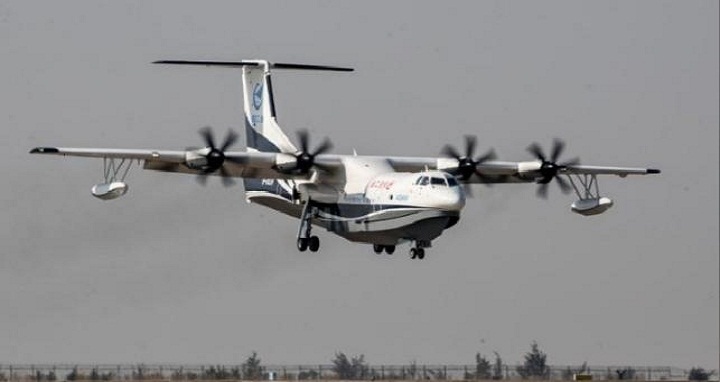 Dhaka, 14 May, Abnews: China expects to deliver its domestically developed AG600, the world’s largest amphibious aircraft, to customers by 2022, the state-run Xinhua news agency reported late on Sunday citing the plane’s manufacturer. “We are endeavouring to get the airworthiness certification from the civil aviation authorities by 2021, and deliver it to the customers by 2022,” Xinhua quoted Huang Lingcai, the plane’s chief designer at state-owned Aviation Industry Corporation of China (AVIC), as saying. China developed the AG600 as part of a drive to modernise its military, amid a more muscular approach to territorial disputes in places like the South China Sea that has rattled nerves in the Asia-Pacific region and the United States. It made its maiden flight in China in December. Huang also said the aircraft would make more flights this year, including its first takeoff from water. AVIC has spent about eight years developing the aircraft, which is roughly the size of a Boeing Co 737 and is designed to carry out marine rescues and battle forest fires. It has a range of up to 4,500 kms (2,800 miles) and is designed to be able to take off and land in two metre (six feet) waves. Powered by four turboprop engines, the AG600 can carry 50 people during maritime search-and-rescue missions, and can scoop up 12 metric tons of water within 20 seconds for fire fighting trips, according to state media.